With fresh sparkling effervescence and a low alcohol content of 3%, Jinro TokTok Pineapple can be enjoyed by everyone on any occasion. 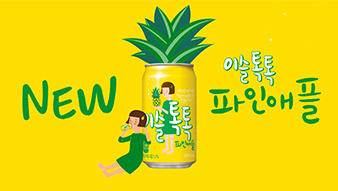 With a mounthful of sparkling pineapple flavor and a low alcohol content of 3%, Jinro TokTok Pineapple can be enjoyed by everyone in any occasion. New Yisul that will capture the heart of Korea. Enjoy Jinro TokTok Peach that will make you feel awesome. With a mouthful of sparkling carbonated peach flavor and a low alcoholic content of 3%, Jinro TokTok Peach can be enjoyed by everyone at anytime. With a mouthful of sparkling carbonated peach flavor and a low alcoholic content of 3%, Jinro TokTok Peach can be enjoyed by everyone at anytime. For 24-year-old Boksuni, there are so many things she wants to know and do. She is shy. though, which is why her nickname is “Pit-A-pat”. She is innocent and makes people happy with her lovely personality.